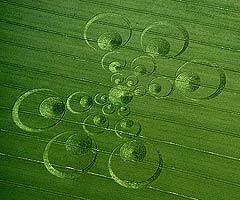 This Crop Circle that appeared at Ogbourne St. George in June, 2003, was considered by many researchers one of the most convincing formations of the season. This was because of the remote location and difficult access to the field, the complexity of the shape and the delicate condition of the lay, showing no apparent evidence of human involvement. The geometry is eight-fold. If you imagine two additional "arms" where the empty spaces are, you get a perfectly symmetrical eight-armed "snowflake". However, as surprising as it may seem at first, the design is constructed entirely on pentagrams and pentagons, five-fold geometry - as will be shown on the following pages.